The first two known Greek men to become Winchester residents were John Dellis and John Pappas. In 1908, they came to the Valley and started a business. Other Greeks followed. In 1932, Father Thomas J Daniels, pastor of Saints Constantine and Helen Greek Orthodox Church of Washington, D.C. served as the first visiting priest to the Winchester Greek Orthodox Community. Since the Greek Orthodox Community did not have a place in which to worship, the local Christ Episcopal Church generously made their church available to the community. Thus, the sacraments of the Greek Orthodox began in Winchester. In 1957, the first and second generation of Hellenic descent, fortified with the ideas of preserving their faith and traditions established a chapter of the Greek Orthodox Youth of America (GOYA). Their first objective was to build a church in their home town. In 1960, the lot of land that the church is currently located on was purchased for $10,000. The funds were available due to the hard work of the members of the community. In 1962, at a community meeting, it was decided to build the church on the lot. With the dedicated effort of the Greek Community members and generous contributions of members, friends and citizens of Winchester, the church was completed for $54,000 in 1964. In 1974, an extension of the church and altar was accomplished, adding about 45 feet to the length for $50,000. This much needed extension allowed the priest to pass between the back wall and the Holy Table. In addition, the entire extension gave a beautiful configuration to our church. Air conditioning was also added. The Iconography of the altar and the purchase of the chandeliers, Epitaphios, Icons, Bishop’s Throne, stain glass windows, sound system, bells, and many other items were graciously donated by dedicated members. After extensive preparations, the Consecration of the Church took place on May 22, 1983 by Bishop Philotheos of Meloa. From 1932 until 2007, the Winchester Greek Orthodox Community was served by visiting priests from Greek Orthodox Churches throughout the greater Washington and Baltimore area. After 75 years, Father Stephen Gousios arrived in 2007 as our first full time priest, serving our Lord and our parish until his departure in mid-2012. 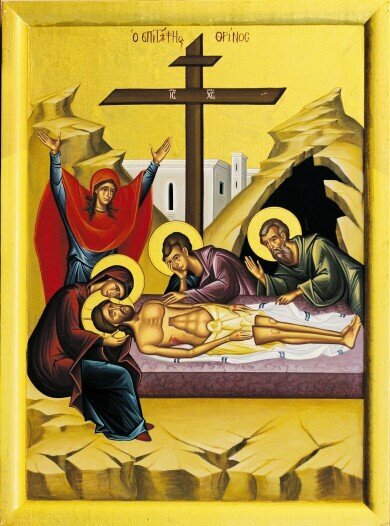 The Dormition of the Virgin Mary returned to a shared ministry until September 2014. In September 2014, Fr. Peter Papanikolaou was assigned to serve our Lord in the Winchester, Virginia Parish. In November 2017, Fr. Michael Kontogiorgis was assigned to serve the Dormition Church. From the earliest gathering of the Greek Orthodox faithful, The Dormition of the Virgin Mary has grown and has made a positive impact on the lives of all who have come in contact with it. We truly hope you will join us in worship.